"BRLC GENERAL ASSEMBLY, ELECTION AND FORUM." The Philippine Librarians Associations, Inc., Bicol Librarians Council will be having an Annual General Assembly and election of a new set of BRLC officers for 2013-2015, on Friday, October 12, 2012, at the Fernando Hall, Ateneo de Naga University , Naga City. As mandated by the PLAI, election of a new set of officers will be conducted this October 2012 for the positions of President, Vice President, Treasurer, Secretary, Auditor and two Board Members. We are calling all Bicol librarians to submit nominees for the said positions by filling out an online form available at the BRLC official website: http://plai-bicolregionlibrarianscouncil.yolasite.com/ This is to ensure that the best candidates in the region are identified for various positions in the Council. I encourage librarians from Albay, Masbate, Sorsogon, Camarines Norte, Camamarines Sur, and Catanduanes to nominate their candidates. All nominees must be present during the Election Day. If nominated, but absent on the day of election, nomination is invalid. As a matter of policy, incumbent officers may be re-elected, but not for the same position. (Please see PLAI Guidelines for Council Election Rules). Online nominations will be accepted from September 10 to 30, 2012. Elected officers are required to attend the PLAI Annual Convention on November 29-30, 2012 in General Santos City to elect the new PLAI (national level) Officers for 2013- 2015. To inspire us in our assembly, we have invited a speaker to talk on the topic “Librarian Leadership in the 21st Century. “ Registration will start at 8:00 am with a fee of P300 to cover food and other incidental expenses. For further clarification/ inquiries, please contact the Nomelec Chair, Ms. Elvie Obias at 472-8447 local 2620 or email her at obias.elvie@gmail.com. As BRLC members, I am calling all of you to attend our General Assembly at Fernando Hall, Ateneo de Naga University, Naga City on Friday, October 12, 2012. 2-day National Conference on "Library Management in the Philippine Setting: Principles and Best Practices"
Free half-day City Tour will commence on the 2nd day of the conference..
distinguished librarians in Bicol. One of them is Dr. Perpetua S.
professional librarians in the Region. significant role in the field of education and information literacy. 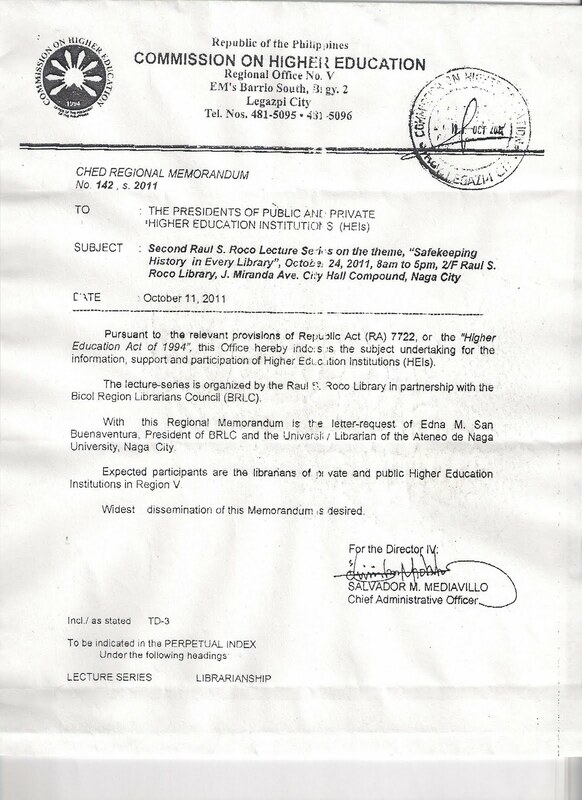 recognition given to distinguished librarian of Bicol. We look forward to your active participation to this event. FELLOW PARTNERS IN LIBRARY SERVICE! 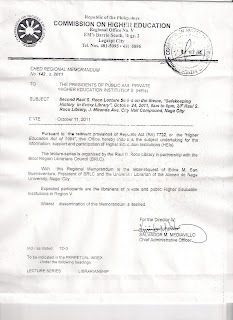 The 2nd RAUL S. ROCO LIBRARY LECTURE will be on October 24, 2011 at the Raul S. Roco Library in Naga City with the theme “ Safekeeping history in every library” to coincide with the celebration of the 7th RAUL S. ROCO DAY. With the Bicol Region Librarians Council as partner, this event will be graced by the newly appointed National Library Director Antonio M. Santos , Ateneo de Manila University Professor Tito Valiente and Elder Floro Gamil of the Church of Jesus Christ of Latter-day Saints. The effective organization of local historical materials in the library, the introduction of genealogy in library service including a workshop on the use of microfilm records available at the NAGA CITY FAMILY HISTORY CENTER comprise this one-day event. You are cordially invited to attend in this event. Registration is Php 350.00 to cover the meals and hand-outs.